Shangri-La’s Villingili Resort & Spa Discover the real essence of Maldives with sensational soft sandy beaches and lush tropical foliage at Shangri-La’s Villingi Resort and Spa. 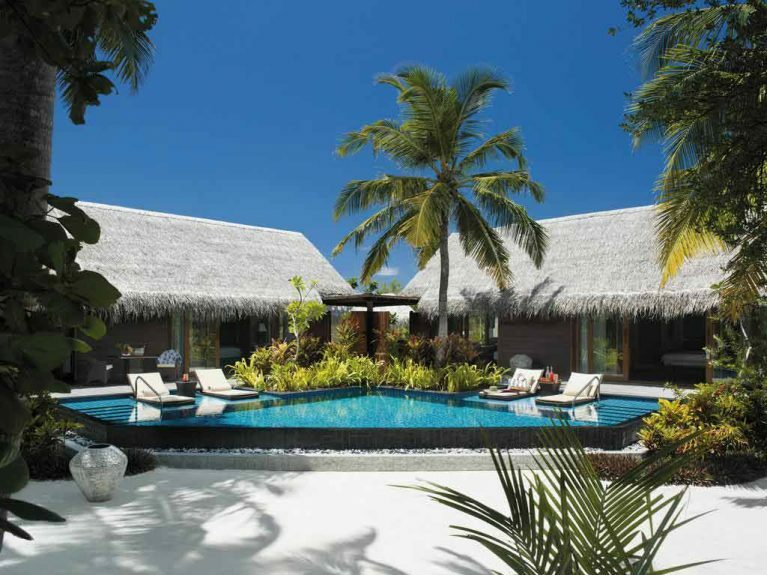 A heavenly retreat, located south of the equator on Villingili island, Shangri-La’s Villingili Resort & Spa offers guest an experience so blissful that will leave you captivated. One can reach this resort through a 70-minutes Domestic Air flight from Male International airport and a 5-minute boat ride from Gan International Airport on Addu Atoll. An elite private hideaway, enjoy the spacious luxurious accommodation set amidst the lush green foliage of island or above the sea. 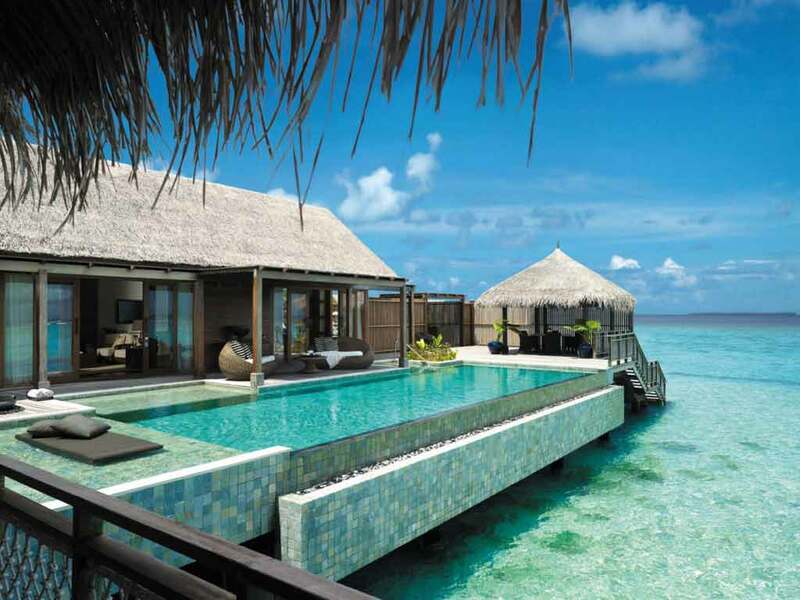 Privacy and sophistication at its best, unravel the premiere Maldives luxury resort. A heavenly retreat for friends, families, and couples relish the incomparable experience. Savor a sumptuous themed dinner set across the soft powdery white sandy beaches. Embark on a journey of self-discovery and rejuvenation at Chi spa. With more than 25 dive sites and a shipwreck to explore Shangri-La is a heaven for divers. Guests can cycle to explore the neighboring islands, work out at the fitness center, practice yoga or enjoy a scenic jog on the marked trails. Water activities include kayaking, scuba-diving and cruising on a luxury yacht. Soothing spa treatments can be enjoyed at CHI – The Spa. Check In at 2 P.M / Check Out at 12 Noon. Late check out until 6 Pm 50% of Nightly room rate. Late check out after 6 Pm 100% of Nightly room rate. Feel the energy of nature flowing in your body at CHI SPA. Located on its own spa village, chi spa is a tranquil secluded sanctuary. Inspired by Asian massage and Ayurveda treatment, embark your body and mind on journey of self-discovery and complete relaxation. The spa offers soothing massages and treatments, manicure, pedicure, yoga pavilion, hydrotherapy. Honeymooners staying for minimum 07 Nights receive 50% Discount on Room Rates. Bride stays on complimentary Full Board basis. 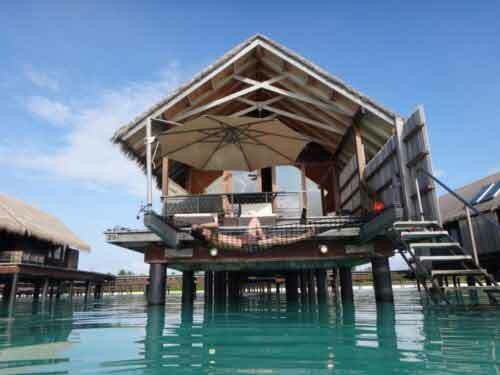 Complimentary upgrade to Water Villa too. 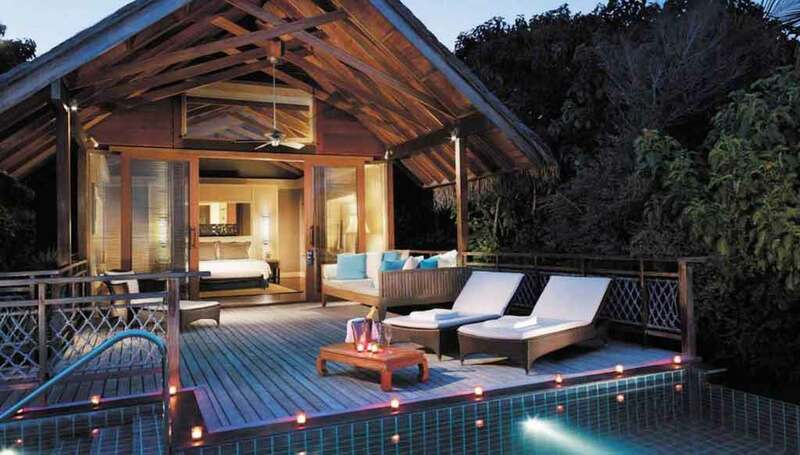 Offer applicable for 7 Nights staying Honeymooners Only. Not Combinable with any other offers listed. Marriage Certificate no later than 9 months post wedding is required at Check-in; offer will not be valid if not presented. Free Half Board Offer: Stay for a minimum 4 Nights & receive complimentary Half Board for whole stay. Applicable for all room type bookings. Combinable with Free Nights & 20% Discount offer. Stay 14 Pay 10 Nights Only. Combinable with 20% Booking Discount + Free Half Board Offer. 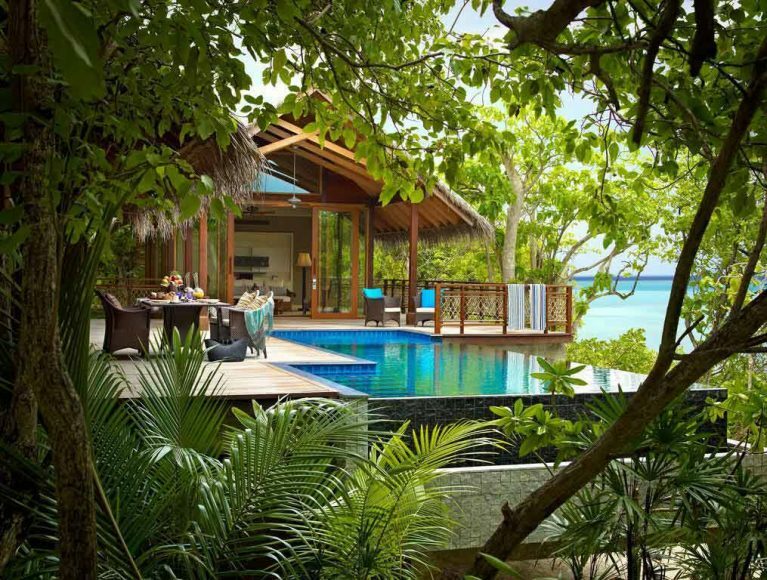 Pool Villa is surrounded by lush forest with unmatched views of the turquoise lagoon, pool villa is a luxurious intimate villa. Offering a tropical beachfront environment the villa features master bedroom with a king size bed, bathroom with open-air shower, oval bathtub and a private terrace with private pool, daybed. One bedroom villa with a maximum occupancy of 3 adults or 1 adult and 3 children or 2 adults and 2 children. 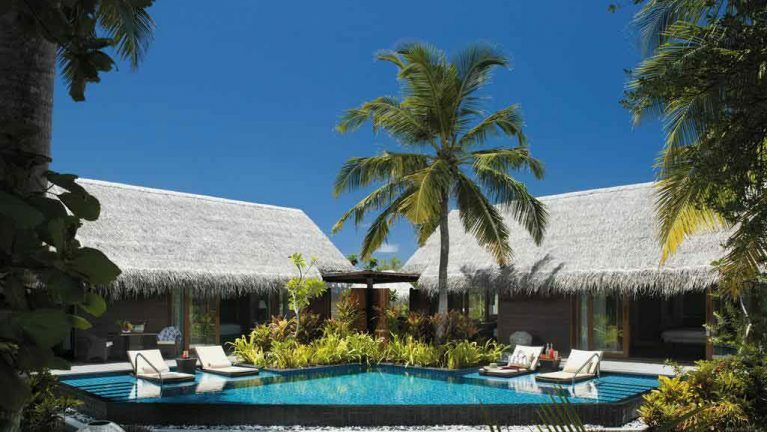 Deluxe Pool Villa located in lavish tranquility on the eastern side of Villingili island, Deluxe Pool Villas are sophisticated villas offering stunning views of gentle ocean. With own spacious garden and intimate coral beach front, the villa offers a master bedroom with King size bed, bathroom with shower, bathtub, living room and outdoor deck with private pool, wooden sundeck. One bedroom villa with a maximum occupancy of 4 persons (1 adult and 3 children, 2 adults and 2 children or 3 adults). 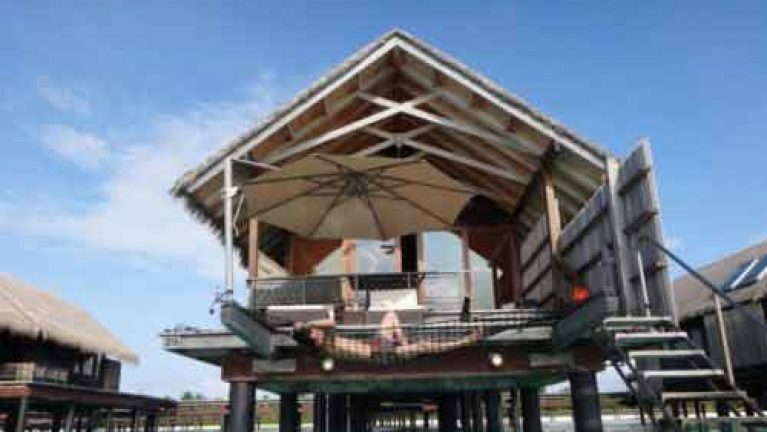 Water villa built on stilts over the turquoise lagoon and connected by timber walkway to main island, are a spacious and chic villa. Secluded from rest of island, it’s an ideal place for couples who don’t want to be distributed. Featuring an open terrace, the villa features a master bedroom with king size bed, bathroom with indoor and outdoor shower, living area. Feel the subtle breeze as you relax in the tropical afternoon. Ocean View Tree House Villa Suspended over the water with marvelous view of the ocean, ocean villa is a perfect infusion of Middle Eastern and Indian designs. Secluded and comforting the villa features a master bedroom with king size bed, oval bathroom with outdoor and indoor shower and open terrace. 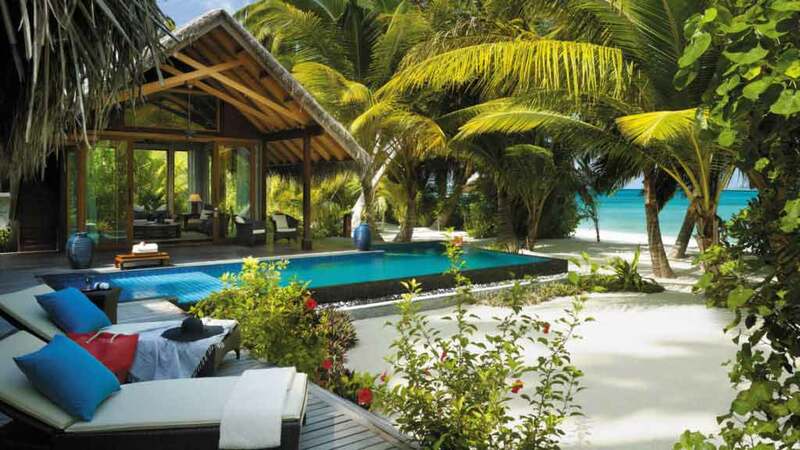 Rocked by soothing sounds of waves, relax in sunbeds enjoying magnificent view of turquoise lagoon. 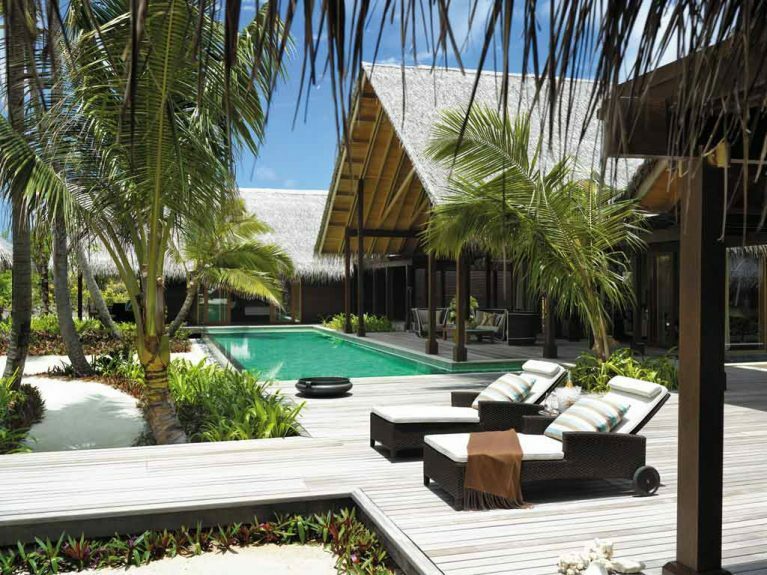 Beach Villa Inspired by idyllic setting of environment, beach villa have two separate pavilions with direct access to beach. Retreat back to stunning views of gentle rolling ocean at beach villa. A barefoot retreat the villa features a master bedroom with king size bed. A bathroom with oval bathtub and a private terrace leading directly to beach. 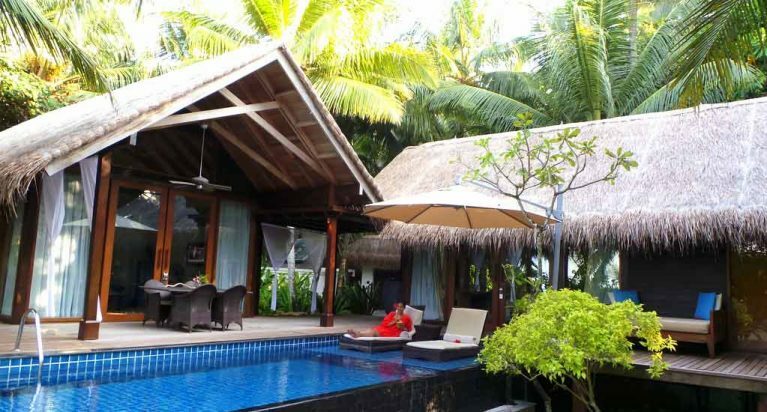 Two Bed Room Beach Villa is ideal choice for families and travelers wanting both privacy and comfort. A perfect infusion of middle eastern and Asian themed interior; the villas are perfect infusion of contemporary and traditional decor. Stunning and tastefully decorated the villa features 2 bedroom with king size bed. A bathroom with oval bathtub and outdoor deck leading to beach. The outdoor deck features own private pool, sun deck and patio. Two detached bedrooms with a total maximum occupancy of 6 persons (1 adult and 5 children, 2 adults and 4 children, 3 adults and 3 children, 4 adults and 2 children, 5 adults and 1 child or 6 adults). 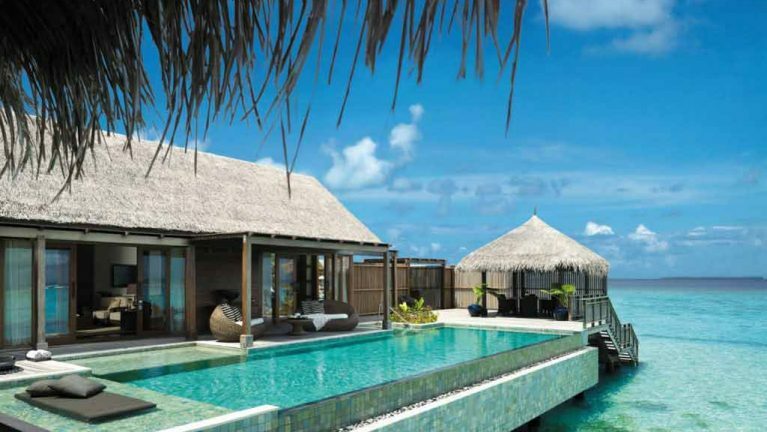 Villa Muthee nestled amidst the exuberant, vibrant environment with stunning view of soothing ocean. 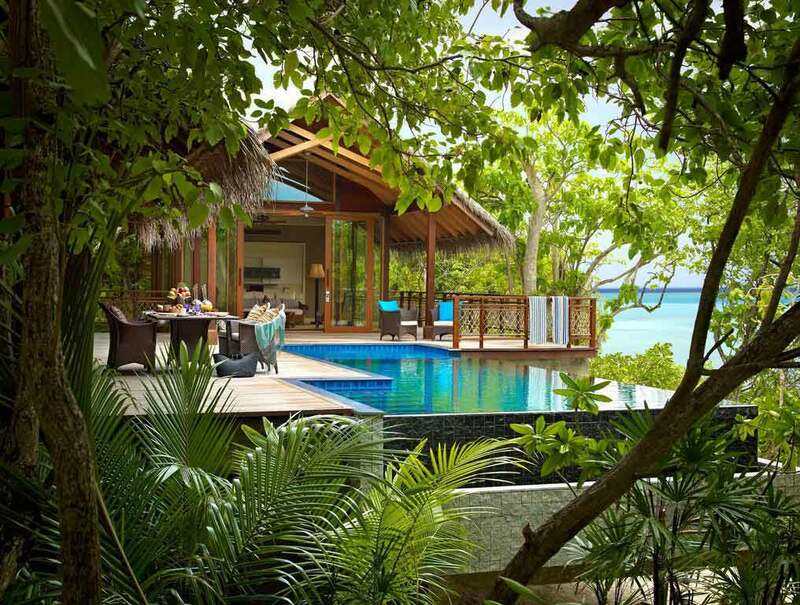 Villa muthee is a perfect island getaway. Translated as pearl in Dhivehi, it’s a pearl in the oyster. With stunning vistas and luxurious ambiance it a natural sanctuary. The villa features a bedroom with king size bed, bathroom with oval bathtub, open air shower and outdoor deck leading to beach. The outdoor deck features own private pool, sun deck and patio. Villa Lallu are spacious with high ceiling bedroom, offering a different experience than any other villas at Resort. This villa is tempted to please everyone with stylish architectural design and high end artifacts. Thoughtfully designed, the villa features a bedroom with king size bed, bathroom with oval bathtub, open air shower and outdoor deck leading to beach. The outdoor deck features own private pool, sun deck and patio. Two bedrooms villa with a total maximum occupancy of 6 persons; (1 adult and 5 children, 2 adults and 4 children, 3 adults and 3 children, 4 adults and 2 children, 5 adults and 1 child or 6 adults). Dr. Ali’s has a simple, fresh and innovative cuisine featuring three distinctive cuisine, Eastern-style living rooms representing the different cultures and cuisines of the Indian Ocean, the South China Sea and the Arabian Gulf. Savor the mouthwatering authentic Indian delicacies at Dr. Ali’s. 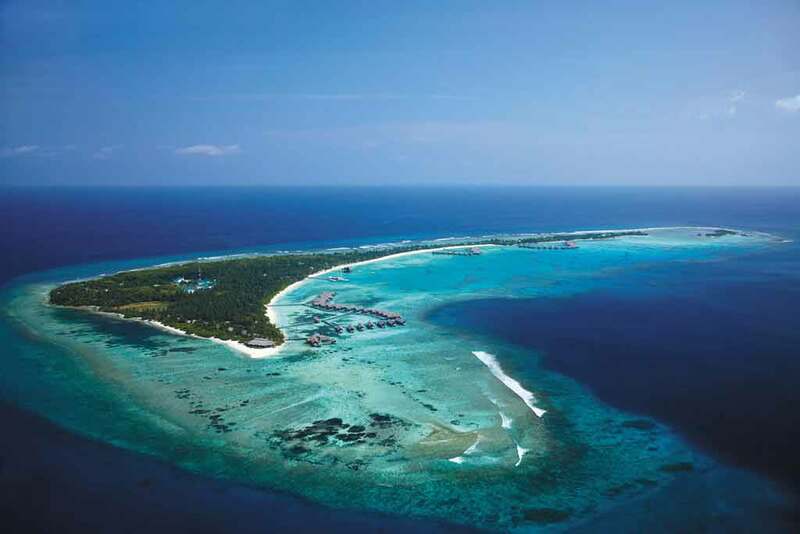 Javvu located along turquoise shorelines, dine in the laid back setting of JAVVU. With magnificent views of the stunning lagoon, the contemporary restaurant serves sumptuous international buffet. Fashala located at the northern tip of the island Fashala lounge is a unique restaurant serving tempting seafood. An intimate dining experience with a perfect backdrop of rhythmic sound of waves, it’s a place where lagoon meets the ocean. Savor tempting fresh sashimi, prawns, lobster freshly picked. Endheri is a stylish pool bar which is Very much the heart of the resort .Featuring a breathtaking backdrop of turquoise waters and pristine beach it’s a perfect place to relax and retreat back. Sip signature drinks, the Endheri breeze. Manzaru enjoy the relaxing music as you drink your favorite cocktail in the Manzaru bar. The bar features two signature drinks and an array of cocktails and handpicked wines from around the globe. M-lounge as the sun sets this lounge comes alive . 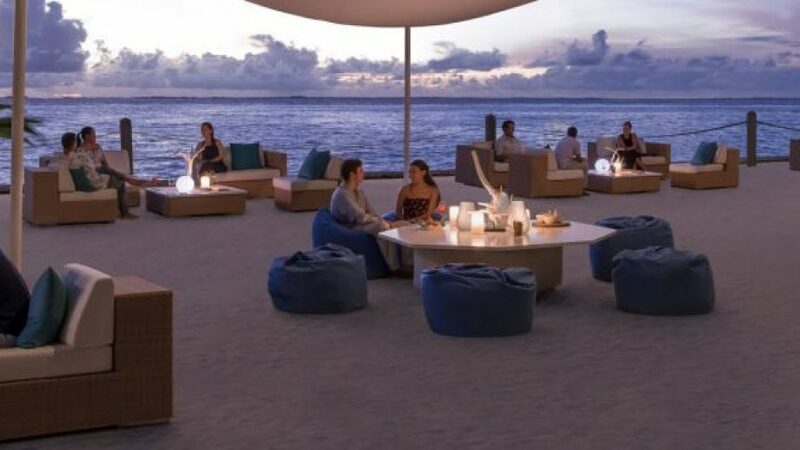 M-lounge atmosphere is the perfect way to enjoy sun-downers, cocktails, wine and champagne while listening to DJ’s upbeat house. First ever 9 hole Golf course in Maldives. Top Luxury Super Deluxe Resort. Unique Ocean view Tree House Villas. Local Islands for cultural & historic excursions.